The wait is finally over: Battlefield 5 Tides of War Chapter 3: Trial by Fire is now live offering 12 weeks of fresh content and challenges. The game's third chapter offers new progression opportunities alongside a slew of tweaks and changes otherwise, including fresh new weapons and items. 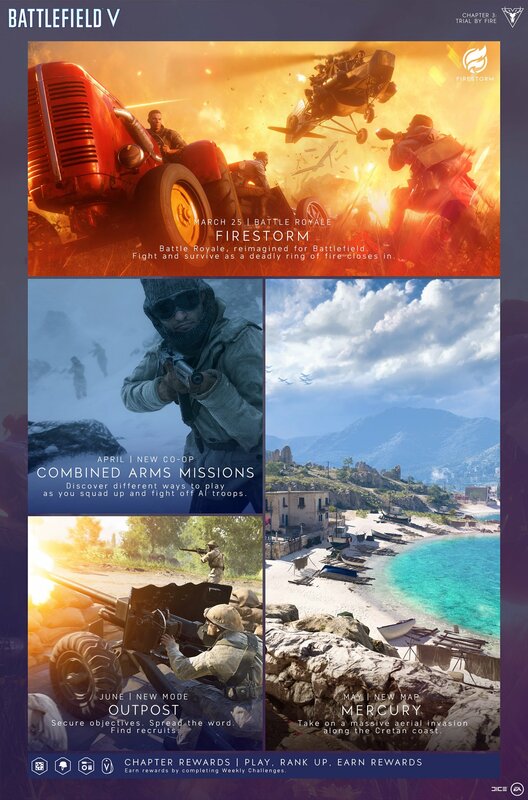 In an announcement post featured over on the official Electronic Arts website, the Battlefield 5 developers offer a remarkably long vertically oriented roadmap showcasing the biggest highlights planned for Chapter 3: Trial By Fire. Check it out below. Among many other details featured in the announcement post, the developers have addressed the weekly challenges offered throughout the Trial by Fire chapter. There will be a total of 12 different weekly challenges for Chapter 3, with each offering "the opportunity to unlock awesome weapons, skins, and other items by competing tasks on the battlefield." The post goes on to specify that players will be able to earn gear like the Commando Carbine and the Firestorm Fire Axe. "[We’re] moving away from the concept of Chapter Events to instead focus solely on weeks and Weekly Challenges," the post reads. "Second, some Weekly Challenges will feature a bonus task available after completing the final task and unlocking the reward. This extra exercise challenges you to use your newly acquired reward. For instance: in Chapter 3, Week 4, you’ll unlock the Commando Carbine at the end of the Weekly Challenge. You can then take your carbine out for a spin in the bonus task Silent Death, where you need to score five kills with it." 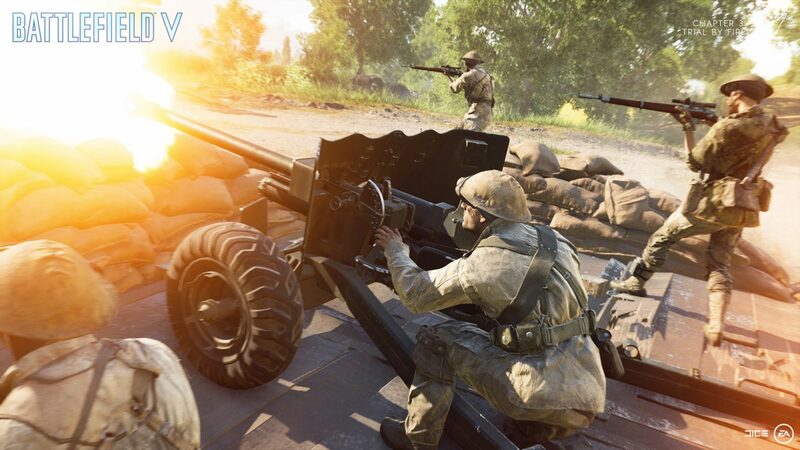 Of course, the launch of Trial by Fire coincides with the release of the Trial by Fire update #1 patch, which addresses loads of in-game issues and offers various adjustments to vehicles, armor, and much more. Be sure to check out the full Battlefield 5 Tides of War Chapter 3: Trial by Fire update #1 patch notes for all of the details. Trial by Fire is finally live in Battlefield 5, and if the provided roadmap is anything to go by, players should have plenty of exciting content to look forward to in the coming weeks and months. For even more news and guides coverage for EA's popular shooter, be sure to stop by Shacknews' Battlefield 5 home page.